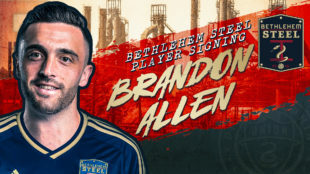 Bethlehem Steel FC has signed 2016 United Soccer League Rookie of the Year striker Brandon Allen. He holds the league scoring record for a rookie with 15 goals in the 2016 season. Allen, 6’1″, 190 pounds and 24 years-old, is a former New York Red Bulls Homegrown Player from Metuchen, New Jersey who was a member of the Red Bulls Academy from 2010-2012. He played for Georgetown University from 2012-2016 setting the school career scoring record in the process with 50 goals in 90 games. Most of his time with Red Bulls was spent on loan to their wholly-owned USL affiliate New York Red Bulls 2, where he scored 15 goals in 2016 as rookie of the year and was the most valuable player in the USL Cup final with a hat trick in the 5-1 win over Swope Park Rangers. He appeared once in 2017 for the Red Bulls first team and spent roughly the second half of 2017 on loan to MLS expansion side Minnesota United FC with whom he also appeared once. Both appearances were less than 10 minutes each. This is the third time Steel head coach Brendan Burke is chosing to work with products from the Red Bulls’ player development system. Bolu Akinyode in 2016 and Adam Najem in 2017 preceded Allen. Burke has stated that he hopes Allen can learn to break the glass ceiling to MLS with the Union organization. Allen offers the Steel successful USL experience in the central channel in front of goal, a position where Earnie Stewart has always had a veteran on his farm team. Should there be a young academy striker in need of intelligent professional examples and guidance, Allen should be able to play that role. His experience should also provide good developmental context for young Academy central midfielders Brenden Aaronson and Michael Pellegrino, and recently rostered Union home grown attacking central mid Anthony Fontana. It is too soon to speculate with whom else he may be combining in the attack, aside from Chris Nanco. Allen clearly did not meet Jesse Marsch’s criteria for success at the Red Bulls’ first-team level, and he did not displace Abu Dinladi in Adrian Heath’s mind with the Loons. The Steel chance allows him an opportunity to seek success with a different organization, whose style of play may better fit his strengths. He is young enough that he still has upside, but he certainly fills one of the veteran roles upon which Coach Burke has centered his young, varying game rosters in the past two seasons. In those regards his signing is similar to that of Hugh Roberts last year. This is a pretty solid signing for Steel FC. Annoying that the front office can get USL business done, but remain COMPELTELY quiet on the first team’s off season. Sounds like a decent move by the Steel. Still waiting for the Union to sign someone though……………. Not a bad move, just need like 8 more to have a roster right? Hate to be negative about a decent signing but that’s what it’s come to.